This text brings together essays on themes of human rights and legal history, reflecting the long and distinguished career as academic writer and human rights activist of Brian Simpson. 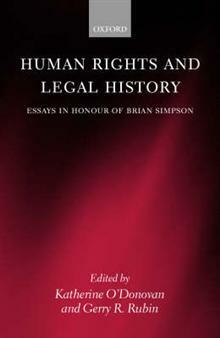 Written by colleagues and friends, the essays are intended to reflect Simpson's own legal inte... read full description below. Edited by Rubin, G. R.
This book brings together essays on themes of human rights and legal history, reflecting the long and distinguished career as academic writer and human rights activist of Brian Simpson. Written by colleagues and friends in the United States and Britain, the essays are intended to reflect Simpson's own legal interests. The collection opens with biography of Simpson's academic life which notes his major contribution to legal thought, and closes with an account of his career in the United States and a bibliography of his writings. As a tribute to Simpson's varied interests in the law, the collection is grouped around themes in human rights, legal philosophy, and legal history. The human rights papers are concerned with the history of the right of individual petition to the European Court of Human Rights, and recent successes in which Brian Simpson played a part; the evolution of a transnational common law of human rights; the United Nations Convention on the Rights of the Child and the interpretation of the provisions on identity in France and England; the suspension of human rights which would have occurred, had the emergency War Zone Courts scheme been brought into effect during wartime; historical resistance to colonial laws in Papua New Guinea; and the ratio decidendi of the story of the Prodigal Son. Historical themes are found in essays concerned with three nineteenth-century Lord Chancellors; in two essays relating to the fate of the civil jury on either side of the Atlantic which provide a fascinating comparison; in the 'battle of the books' which led to changes in eighteenth-century copyright law; and judicial rivalry between King's Bench and Common Pleas in the early modern period.